Spodoptera frigiperda Sf9 cells were harvested at 60 h post infection, lysed in 50 mM Tris-HCl pH 8.0, 150 mM EDTA, 0.5% NP-40, and insoluble fraction was removed by centrifugation at 30.000g for 15 min. 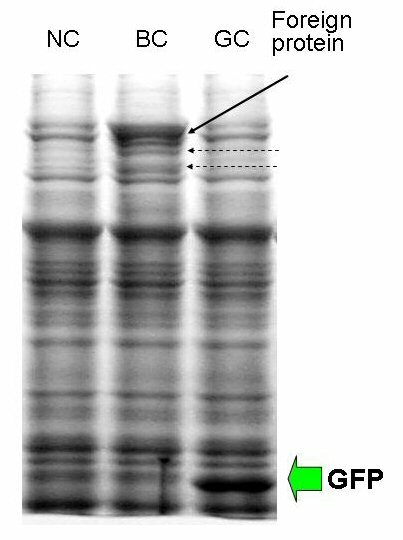 Soluble proteins were separated in 11% SDS-PAGE and stained with Coomassie blue. NC. As a negative control in experiments involving recombinant baculoviruses. GC. As a positive control in experiments involving measurements of green protein fluorescence with ProGreen™ or ProFold™ vectors (Cat. #A1 - #A6). Negative control (NC) is essential in practically any experiment. Mock-infected cells are sometimes used for this purpose. However, it is not a good negative control in baculovirus protein expression studies as baculovirus infection alters the expression profile of the host cells. Moreover, there are many baculovirus proteins, which are not present in the uninfected cells. Cells infected with a wild type or recombinant baculovirus, e.g. a parent BacPAK6 vector, provide a much better negative control. However, proteins abundantly expressed by the control baculoviruses, e.g, b-galactosidase expressed by the BacPAK6 vector, or polyhedrin expressed by the wild-type baculovirus, or any protein of interest expressed in a randomly picked recombinant baculovirus control (BC) may complicate data interpretation. These proteins or their sometimes observed degradation products (shown by dashed arrows), may have similar mobility in the SDS-PAGE to the protein of interest. Therefore, we recommend a negative control recombinant baculovirus (NC), which is identical to the wild type Autographa californica nuclearpolyhedrosis virus, except it does not express polyhedrin or any other protein in the polyhedrin site (Belyaev A.S. et al., J. Mol. Biol., 241: 744-746, 1994). Green Control (GC) provides for expression of Aequorea victoria green-fluorescent protein (GFP), (Acc# L29345. GC is recommended as a positive control baculovirus in experiments where GFP fluorescence is used to monitor virus propagation, optimize cultivation conditions, or titrate of virus stocks (Sapp C. M. et al., J. Biomed. Sci., 6: 342-348, 1999; Kung S.H. et al., J. Virol. Methods, 90: 205-212, 2000; Sastry L. et al., Gene Ther., 9: 1155-1162, 2002; Gangolli S.S. et al., J. Virol. Methods, 109: 133-138, 2003; Luby-Phelps, K. et al., J. Histochem Cytochem. 51: 271-274, 2003; Hitt D.C. et al., Mol. Biotechnol., 14: 197-203, 2000; Barrett J.W. et al., Tissue Cell, 30: 602-616, 1998; Luby-Phelps, K. et al., J. Histochem Cytochem. 51: 271-274, 2003; Hitt D.C. et al., Mol. Biotechnol., 14: 197-203, 2000; Barrett J.W. et al., Tissue Cell, 30: 602-616, 1998).